The Plum Premium Adventure Playhouse is a very interesting and stylish type of playhouse. It has a very classic type of charm to it and is something that is going to give the kids many years of enjoyment. Parents too will get a lot of fun out of this as they can watch the kids make use of all the features. The actual playhouse is a good size and just before they get to that there is a lovely little decking area they can play on. As this is a tower playhouse it is quite high of the ground so they can have a blast climbing up the ladder and then zooming down the slide. There is even quite a bit of space underneath the playhouse where they can play or even have a little picnic. 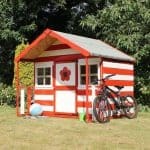 Strong and long lasting European spruce wood has been used to make this playhouse. This is what gives it, it’s very attractive look and is also what is going to ensure it stands strong for many years. Even though this type of wood is very tough, the way the tongue and groove shiplap cladding has been made still gives it a very friendly type of appearance. The flooring is made with tongue and groove boards which as well as taking lots of weight also have a very appealing look to them. We really do love how impressive, strong and somewhat old school the Plum Premium Adventure Playhouse is. They have clearly gone for a more classic type of look with this playhouse and we think that it works very well in making this a little different for all the rest. This is a good sized structure and we feel that even smaller gardens should be able to accommodate this. The depth is 9 feet 9 inches and the width, 6 feet 2 inches, but this is for the whole structure. Still inside the actual playhouse the kids will have plenty of room to play. One of the things that we really like about this playhouse is how it is a little bit higher, kids seem to love tower playhouses as most of the time they have a ladder and wow does this one have an awesome ladder. Kids will be able to get some serious speed on this thing and then they can climb back up the ladders and have another go. At the top of the ladders there is this very nice decking area that has a little fence to make sure the kids are not jumping off there. The apex roof is very well made with some top quality wood. This will keep the rain from sitting on top and always make sure it runs off. The felt that they have selected has a very attractive look to it so as well as being practical it helps the overall appearance of the playhouse. 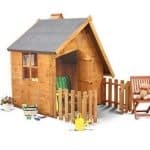 This playhouse is made with very high quality, European spruce wood. They have used tongue and groove shiplap cladding which you can see from the pictures has a very appealing look to it. This type of cladding is used because it slots together tightly to stop water getting into the playhouse. If you look closely enough at some of the pictures, you can see a thick and sturdy frame. This is going to ensure this is one very robust structure and that it is able to take a bit of rough play from the kids. We all know how they love to throw their toys around, jump and even wrestle. Well this frame will make sure the whole playhouse can take this kind of roughhousing. The flooring which you can see from the pictures is made with high quality tongue and groove boards. Now these may make the overall price of the playhouse a little more expensive, but these really are top quality boards that can take a lot of weight so we think they are worth it. These boards are used for both the inside and the outside of the playhouse. That European spruce wood really does look amazing, but you will want to make sure that it stays free from rot and the way to do this is with a coating of wood treatment. We always suggest that you do not put this off and do it within the first week of installing the playhouse. A new coating once a year will keep this playhouse looking brand new for many years. 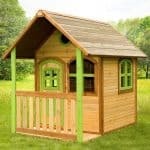 A 12 month guarantee against rot and insect damage is included with this playhouse, but as long as you treat the wood right, you should not need to make use of it. Ok so here is something that confuses us a little bit. 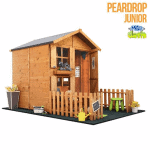 While there is a good sized area for the kids to get in and out of on the Plum Premium Adventure Playhouse there is not actually a door that is included with this. This means that it is always going to be open to the elements, but at the same time it does offer the kids a place where they can just come and go. Still we find it very odd that they would not include a door or even give you the option of adding one. Just the like the situation with the door, the windows are not included with this playhouse. There is an open area on the front and at the side, but that is all there is. We think that even some lower cost styrene windows would have been better than leaving them empty. Most playhouses do not come with any way to lock them and that is fine and we fully understand why. However as this one does not have a door or windows, you will certainly not want the children leaving anything expensive inside of here. Due to the lack of door and windows not much privacy is offered with this playhouse, but we are sure when the kids are playing inside or going up and down the slide they really will not care. 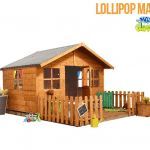 This is a playhouse that has its own style and as a result no customisation options are offered. Now to be fair this is the case with most playhouses so we will not be too harsh on them for this. While we love that European spruce wood the way it is, you could always brighten it up with a more exciting colour of wood treatment. No extras are offered directly, but if you do want to keep this more protected from the elements then you will want to look into buying a door and some windows. To be honest this does not have to be as expensive as you would think. Two sheets of styrene can be used for the windows at very little cost and we are sure you could either use some cheap boarding for a door if you want to add a door for as little money as possible. Or of course you could always just buy an actual door if you feel a cheap bit of board would stick out like a sore thumb. We really cannot deny just how impressively strong the European spruce wood is and that does make this a strong and high quality structure. While you will have to treat it to protect from rot, the materials used are long lasting. We do though worry a little about rain and snow always getting into the playhouse. The kids are going to love everything that this playhouse offers. The high ladders, the slide and of course the playhouse. There is just many different things to do here that they will be able to enjoy this for many years. This is a two person job, but we feel it should take you no longer than 4-6 hours. Instructions are included so be sure to follow them and have a tea break if you start to get stressed out. We love the look and the wood that this playhouse is made from and its classic style, but not having a door or windows does make us question the asking price. 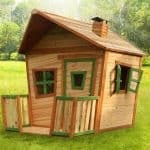 Final Thoughts: We really love it when a company makes a playhouse that is clearly supposed to have something of an old school charm and this is certainly what the Plum Premium Adventure Playhouse has. We also really like how robust and long lasting this is thanks to the wood it is made from. Then of course there are the fun features such as the slide, ladder and the area underneath. In all, we really do like what they have done here, but we cannot overlook the lack of a door or windows, especially considering the asking price. 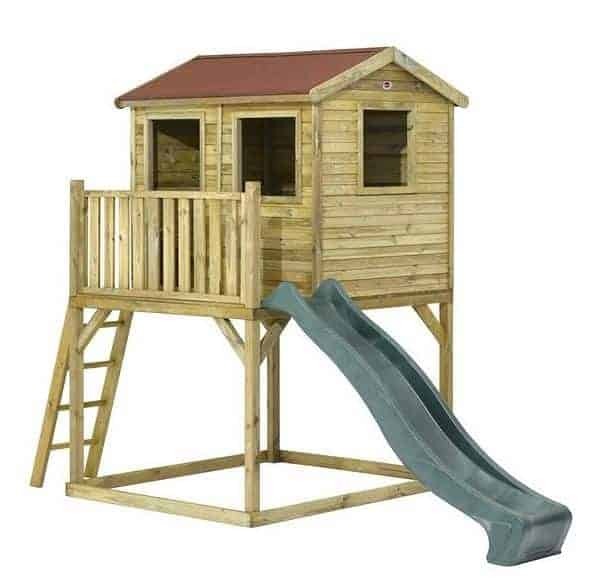 However if you can overlook this then, we are sure you will be very happy with this playhouse and your kids will have a lot of fun with it, especially going down that slide.